The CBC reports some telecom analysts have questioned the effectiveness of the ongoing ‘Fair for Canada’ PR campaign waged by Rogers, Telus and Bell, which argue Ottawa’s wireless spectrum policies are unfair as they favour Verizon, despite the Federal government consulting carriers prior to establishing the rules. “Since the print campaign was launched, we’ve had the minister of industry say ‘Ok, thank you, I’ve heard you — NO. And then a week later we heard the prime minister… say, ‘You didn’t understand the minister? The answer is NO. John-Kurt Pliniussen, an associate professor in innovation, sales management and e-marketing at Queen’s University school of business says incumbents should have argued to improve their service over the years’ past, instead of playing the patriotism card. He cites how complaints have risen over the years in regards to wireless carriers, from roughly 900 four or five years ago to now over 7,000. Last fall’s annual CCTS report noted 60 per cent of the 11,000 complaints filed were related to wireless services. Yesterday, the Fraser Institute think tank suggested relaxing foreign ownership rules would encourage wireless competition. A recent Forum Research poll indicated 57% of Canadians would welcome Verizon or other US carriers setting up shop here, but according to their data, 65% agree Verizon should not be favoured in the upcoming spectrum auction. In contrast to this data, our own unscientific poll resulted in almost 62% of voters showing support for Verizon and newer entrants to be favoured in the upcoming auction. On top of the ‘Fair for Canada’ campaign, incumbent supporters have been vocal in the media, such as Telus Director Stockwell Day calling for Ottawa to delay the spectrum auction. Chairman of the Telus Atlantic Canada Community Board retired General Rick Hillier, generalized Ottawa’s policies as “Canada Last” as he believes they favour Verizon over Canadian incumbents. Last week, close to 500 Telus employees organized a protest outside Industry Minster James Moore’s constituency office in Port Moody calling for change. With the September 17 application deadline looming for the 700MHz spectrum auction, the race is on for the Big 3 to convince Ottawa to alter its wireless policies, despite the latter reiterating the auction will move forward as planned. 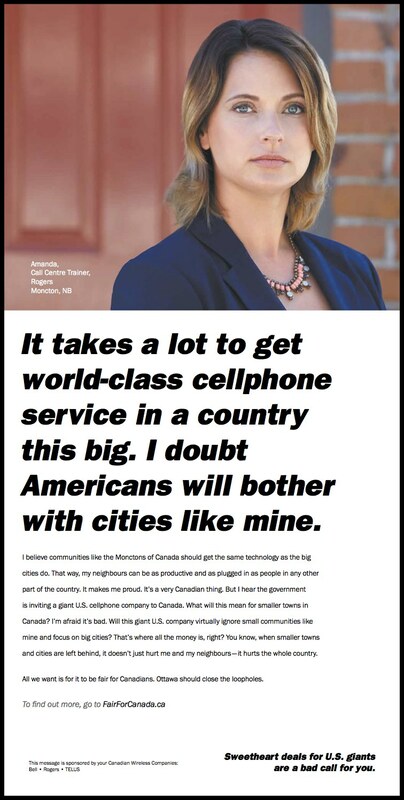 What do you think of the ‘Fair for Canada’ campaign? Is it working or do you disagree with the message?